TODAY WE WILL TAKE A break from pottery design and painting,” announced Mr. Phintias on Friday at the start of second-period Crafts-ology. He was standing in front of a wall of shelves lined with vases, urns, and pots. Many were decorated with reddish-orange silhouette figures on glazed black backgrounds. The amazing feats of the gods and goddesses of Mount Olympus were the main subjects of these painted scenes. And this teacher had created much of the stunningly beautiful clay pottery himself! At his announcement most of the class groaned with disappointment. Reluctantly they started putting away the clay they’d begun unwrapping, as well as their sculpting tools and paintbrushes. However, twelve-year-old Hestia breathed a sigh of relief as she plunked her half-finished clay pot back onto its shelf. While other students had unique, fantastical, or elegant pots, bowls, and urns in progress, her pot was plain old boring in her opinion. The kind you could buy anywhere down on Earth. He was one of Mount Olympus Academy’s most mega-cool teachers, far younger and hipper than some teachers, such as Mr. Cyclops, who taught Hero-ology. However, making painted pottery was Mr. Phintias’s life. And he didn’t always understand that not everyone was necessarily as excited about it. At least Hestia wasn’t. The craft of pottery-making was just not her thing. As she sat back down at her table, her fingers reached into the pocket of the tomato-red chiton she wore. They touched the edges of the blank cards she always carried, just in case she had a recipe brainstorm and wanted to jot down ideas and ingredients. She’d much rather use her creativity to come up with tasty concoctions to fill those pretty pots, bowls, and urns they made in this class. In other words, her favorite art was cooking! He paused as a murmur of voices indicated that students were indeed aware of the Service to Humankind contest. As they quieted, his dark brown eyes swept the room, flicking from student to student. Hestia quickly repositioned herself behind a mortal girl named Pandora at her table. Fingers crossed Hestia wouldn’t be called on for anything. “What is the award, exactly?” Pandora interrupted. “That will be revealed at a banquet in honor of the eleven finalists, when one of them is announced the winner,” the teacher replied with a small smile in Pandora’s direction. The student he’d thumped was Heracles, a superstrong mortal who wore a lion-skin cape with jaws that fit over his head like a helmet. That monstrous lion had once terrorized an entire village till Heracles had fought it and won. “Eew,” squealed a couple of girls, making ick faces. But Hestia and the rest of the class laughed. Heracles had done all those things (and more) as part of twelve labors he’d performed in order to win a permanent place as a student at the Academy. Their illustrious school was perched at the very top of Mount Olympus, the highest mountain in Greece. Mostly godboys and goddessgirls went here, but Principal Zeus had also invited a handful of mortals, like Heracles, to attend. For a few minutes, he happily described in way more detail than was necessary the art techniques and materials he and the other artists would use. As his dark eyes twinkled and he gestured broadly, Hestia realized that the prospect of painting the mural was as exciting to him as creating a new recipe and trying it out in the school’s kitchen was to her. In a way, they were both artists! Clay and paint were his raw materials. Hers were spices, flour, and other foodstuffs. As he began walking around the room and through the spaces between the tables where students sat, heads turned to follow the teacher. “So, you are likely wondering what all this has to do with today’s Crafts-ology assignment. Well, graphic design is a fascinating, specialized skill that can encompass the design of scrollazines, books, shields, product packaging, logos, and much more. And what I would like each of you to do this morning is to come up with your own logo—a symbol, that is—to represent your highest, most exalted self.” He grinned and winked at them. “You mean like my symbol might be a lion?” Heracles piped up. “Exactly,” Mr. Phintias said, gently cutting her off. Because if he hadn’t, her questions would likely have multiplied so fast, they’d have taken up the rest of class time! Famed for her curiosity, Pandora often spoke in questions even when making statements. Her symbol or logo should definitely be a question mark, thought Hestia. But wait. Pandora was already using that logo, come to think of it. She wore her bangs in the shape of question marks. Hestia had even seen her in the hallway of MOA’s fourth-floor girls’ dorm wearing pj’s decorated with question marks. So this assignment should be an easy-peasy one for her! Must be nice, thought Hestia as she stared down at the fresh sheet of papyrus Mr. Phintias had placed before her. Because suddenly her mind had gone as blank as the papyrus was. What should my symbol be? she wondered. What should I choose? She brushed the fluffy end of her self-inking feather pen against her cheek. Knowing she only had minutes to come up with a logo, familiar feelings of panic welled up inside. She’d never been good at in-class assignments. She didn’t like being put on the spot like this. Why couldn’t the task of coming up with a logo have been homework, so she could’ve had more time to think? She glanced around the room. The others all seemed to be busily sketching. Gulp. Of course, the student who probably had the best shot at winning this Service to Humankind Award wasn’t even in this class: Principal Zeus’s daughter, Athena. That brainy girl’s numerous inventions had helped mortals a lot. She had invented sailing ships, musical instruments like the flute and the trumpet, weaving and other needle arts, and the plow (which made it easier for farmers to plant rows in their fields). Then there was the olive, which had many uses. Its oil burned brightly in lamps. It was a popular food, too, and olive wood was good for building homes. Athena had already helped humans so much that they’d named the city of Athens after her! Hestia pushed the tip of her feather pen across the paper, trying to look as busy as everyone else seemed to be. Really, she was only making doodles. She drew a little owl—one of Athena’s symbols—that turned out to accidentally resemble a cat. If that goddessgirl entered the contest, her only problem with this assignment would be the hard time she’d have choosing between many possible symbols. One of her titles was the goddess of wisdom. Sometimes she wore owl earrings or other jewelry with wise owl designs. Hestia really admired the girl. Along with her BFFs—Aphrodite, Persephone, and Artemis—Athena was one of the most popular goddessgirls at MOA. “What do you think of this?” she overheard another girl say from the table right next to her own. It was Aphrodite, the goddessgirl of love and beauty. She was holding up a sketch of a bouquet of red and pink hearts to show Pandora. “Think so?” said the beautiful Aphrodite, sounding pleased. Hestia watched the goddessgirl push her long golden hair, which was threaded with pink satin ribbons, behind her perfectly shaped ears. Then Aphrodite reached for a glittery pink handbag that was hanging on the back of her chair and took out a tube of lip gloss. The color of the bag perfectly matched the chiton she wore. Her handbag and the chiton were probably new, since Hestia had never seen them before. How many purses and chitons did that goddessgirl have, anyway? A mega-zillion? And she looked fabulous with all of them! Hestia admired Aphrodite almost as much as she did Athena, despite the fact that Hestia and the goddessgirl of love and beauty were practically total opposites. Aphrodite was as outgoing and fashionable as Hestia was shy and clueless about fashion. The beautiful goddessgirl’s Lonely Hearts Club really had helped many mortals find happiness. Why, she’d even helped Principal Zeus find true love with the goddess Hera, who was now his wife! Hmm. Pandora could be right. Mortals did like finding love. Maybe Aphrodite would win this award. Looking around the room, Hestia noticed that almost everyone had already sketched at least one idea for a symbol. And all the ones she could see seemed more awesome than anything she could come up with for herself. Heracles had drawn a lion’s head. Dionysus had drawn masks of comedy and tragedy. As the male lead in almost all the school plays, his acting had inspired hundreds of mortal playwrights, poets, and actors. And Iris, the goddessgirl of rainbows, had helped save the world from the rampages of a terrible Titan monster named Typhon. So she had drawn—what else?—a colorful and sparkly rainbow such as the one she’d traveled across during her adventures. Talk about pizzazz! When Hestia saw Mr. Phintias glance at the sundial outside the classroom window, she knew time was running out. “One more minute,” he announced. A new bolt of panic shot through her like one of Zeus’s thunderbolts. In the nick of time she scribbled the first thing that came to mind. Hands instantly waved in the air. 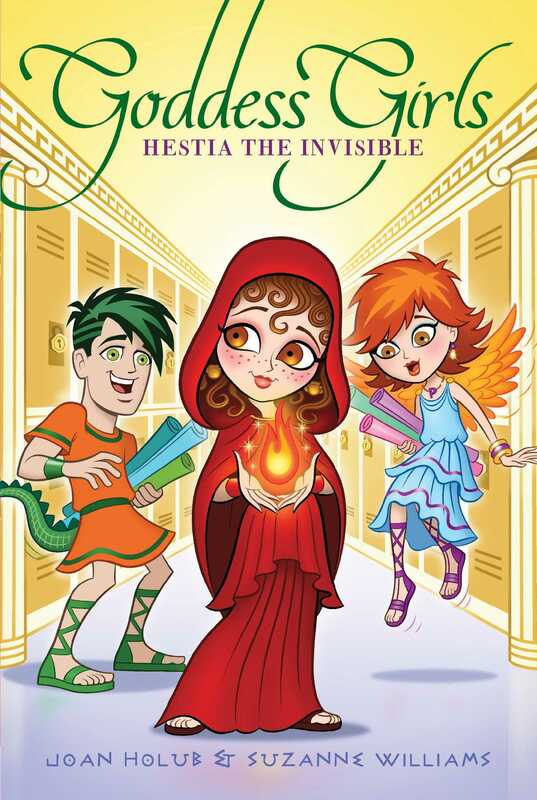 But Hestia, true to her shy nature, did her best to become invisible. Ducking her head, she let her light-brown curls fall across her cheeks. She closed herself up like a turtle, pulling the red hood she wore forward to shadow her face. She’d added hoods to the pattern she used to make all of her home-sewn chitons. They were perfect for hiding out in. And cute, too! This attention-avoiding strategy had worked surprisingly well for her in the four years she’d been at MOA. Especially since there was never any shortage of other, more eager-to-talk students for teachers to pick from. Her invisibility strategy might have worked today too, if she hadn’t blown her cover. It was nearly the end of the period when muscle-bound Atlas, MOA’s champion weight lifter, held up his symbol. He’d drawn two horizontal parallel lines, except the top line had a bump in the middle. Everyone squinted at it. “Is it a hill beside a road?” Pandora asked. “Or a snake who’s swallowed a mouse?” Dionysus guessed. Atlas frowned. “No and no,” he said, sounding frustrated. “Can’t you tell?” He held the picture out toward them. No one contradicted his version of that event, even though most of them knew that “holding up the sky” had only been a joke Heracles had played on the big guy. The sky couldn’t really fall down, after all. Atlas might have been mega-strong, but he wasn’t the sharpest knife in the drawer. Still, no one wanted to hurt his feelings with the truth, so they all played along. Because there were only a few minutes left in the period, Hestia had begun to relax. She’d figured she was off the hook for sharing. Unfortunately, her blurt-out had drawn Mr. Phintias’s attention. His eyes fastened on her as Atlas retook his seat. Her clasped hands tightened as she sat there, dreading what she knew in her heart was coming. Hestia froze in her chair. Her mouth went dry. “I . . . um . . . I . . . ” she mumbled softly. “Huh?” “What did she say?” students murmured. They cupped their ears and strained toward her. “Give her a second,” advised a godboy named Ascalabus (Asca for short) who sat one table over. He had black hair with a natural green stripe through it that matched his lizard tail. All the attention only made Hestia tug her hood farther over her face and slide lower in her seat in embarrassment. “Please stand and speak out. That way we can all hear you,” Mr. Phintias told her. His voice was firm but not unkind. Wishing she could sink into the floor, Hestia nevertheless did as instructed. She got to her feet. She hoped the end-of-class lyrebell would ring before she could speak, but no such luck. A ripple of surprised laughter ran through the classroom. “You mean like a cooking pot?” Pandora asked, peering closely at Hestia’s drawing. Hestia flushed deeply. Mortified, she nodded. What was wrong with her choice of symbol? Cooking was what she liked to do, and it was also what she was best at. She usually didn’t try anything too exotic but mostly stuck to plain, hearty fare using simple tools—like a kettle. Admittedly, however, not many students knew she liked to cook. She’d always been way too shy to share her enthusiasm with them. So their current confusion was sort of understandable. “Okay. I’ll . . . um . . . think about it some more,” Hestia mumbled, taking her seat again in relief. Ping. Ping. Ping. At long last the lyrebell chimed. Hestia crumpled her sketch and shoved it into her schoolbag. Still stinging from the class’s reaction to her kettle symbol, she left the room as quickly as possible. Keeping her hooded head down and avoiding eye contact with anyone, she managed to ward off conversation. It didn’t matter what symbol she chose. No way would she enter the contest. Who wanted a bunch of people staring at their image in a giant mural? Not her! On her way down the hall, she stopped near the lockers to take a drink from a golden fountain along the wall. Instead of spouting water, the fountains at the Academy spouted nectar. Did that mean Aphrodite thought she was as ordinary as a cooking pot? Ears burning, Hestia was suddenly glad for the “invisibility” her hood provided. The two goddessgirls never glanced her way, and a moment later they moved off. Maybe I am ordinary, thought Hestia. So what? Still, that remark of Aphrodite’s had kind of hurt. Everyone wanted to be special in some way. Even ordinary old her. She’d always admired Aphrodite, who was so beautiful that boys couldn’t help staring at her. Hestia wouldn’t want that for herself, of course. She didn’t like to be stared at. But being practically invisible wasn’t so great either. Somewhere in between might be better. Just normal recognition. As she headed for the cafeteria, where she apprenticed in the kitchen during third period, a desire to make a change slowly kindled in Hestia like a fire starting in a hearth. Joan Holub has authored and/or illustrated over 140 children’s books, including the Goddess Girls series, the Heroes in Training series, the New York Times bestselling picture book Mighty Dads (illustrated by James Dean), and Little Red Writing (illustrated by Melissa Sweet). She lives in North Carolina and is online at JoanHolub.com. Suzanne Williams is a former elementary school librarian and the author of over seventy books for children, including the award-winning picture books Library Lil (illustrated by Steven Kellogg) and My Dog Never Says Please (illustrated by Tedd Arnold), and several chapter book and middle grade series. She also coauthors the Goddess Girls and Thunder Girls series with the fantastic Joan Holub. Visit her at Suzanne-Williams.com.